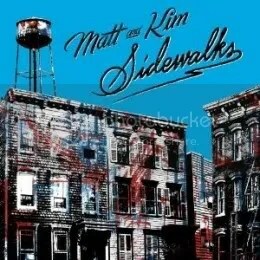 Matt & Kim, the too-cute couple duo from Brooklyn, present their third full-length album. Their sound hasn’t changed too much from their previous albums: upbeat indie pop/rock with nerdy male vocals. Fans of previous albums should be pleased. I’m personally not as crazy about this as I was for their first two albums, but I could see this growing on me if I give it more spins. I don’t think it’s as immediately catchy as their previous releases, but it seems to have more potential for staying in rotation. The songs seem to have more happening and won’t wear thin after a few plays. So for that, it could very well end up being my favorite album by these two kids. For those that are curious, “Cameras” is the album’s first single and “AM/FM Sound” is my favorite track after my first play of the album in its entirety. This entry was posted on October 29, 2010 at 12:00 pm and filed under TheSlacker. You can follow any responses to this entry through the RSS feed.